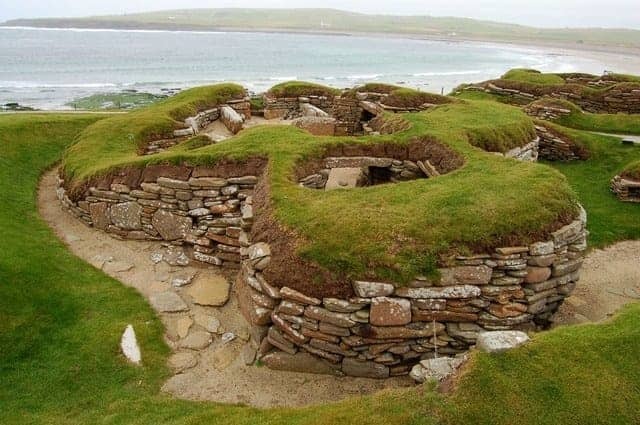 The Neolithic settlement of Skara Brae is near the Bay of Skaill on the largest of the Orkney Islands in Scotland. It is the best-preserved group of prehistoric houses in western Europe and dates back to its first occupation around 3000 BC. A UNESCO world heritage site, it has been called the Scottish Pompeii in reflection of its high quality preservation. The site presents a picture of life around 5,000 years ago in this prehistoric village and visitors can see ancient homes fitted with stone bed enclosures, dressers and seats and a replica construction of the interior of a prehistoric house.